As a nursing or allied health educator, conducting a compliant background check is key for meeting clinical site requirements. Our resource kit can help you create an effective program. To access our resource kit, simply complete the form below. The NCIC: Who Can Query and When? Although the FBI database can appear to be an accurate search, screening experts agree it should never be considered a gold standard. Learn what mistakes to avoid when dealing with FBI fingerprint criminal searches. 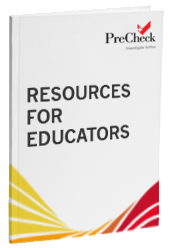 With our resource kit, you’ll learn what information is available in the NCIC database as well as key considerations when determining whether to include this search in your student screening program.